With their latest announcement, the CRM giant, Salesforce, continues to do what Salesforce does best. And we don’t just mean supplying and powering one of the most robust CRM platforms, but rather forward thinking and innovation. Salesforce has a history of jumping on industry trends as they emerge, and this year is no different with the introduction of Salesforce Einstein – or as Salesforce optimistically puts it, Artificial Intelligence for everyone. Many of us will agree that Artificial Intelligence will be the next big thing for tech. With machine learning, there’s no shortage of possible use cases and improvements that can be made in almost any industry. Of course, any industry that utilizes a massive set of data and information can benefit the most from a powerful, Artificial Intelligence to help weed through the information, and highlight the most important aspects, or changes to be made. So it should not come as much of a surprise to hear that Salesforce, a forward thinking company, has jumped on the AI hype train. 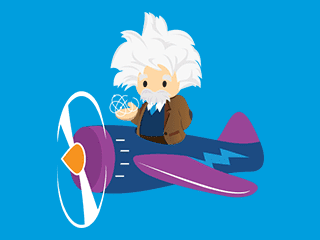 Salesforce said that Einstein will remove the complexity that currently overwhelms any potential AI platforms in order to enable any company, business, organization, team or industry to deliver more personalized, predictive and intelligent customer experiences. 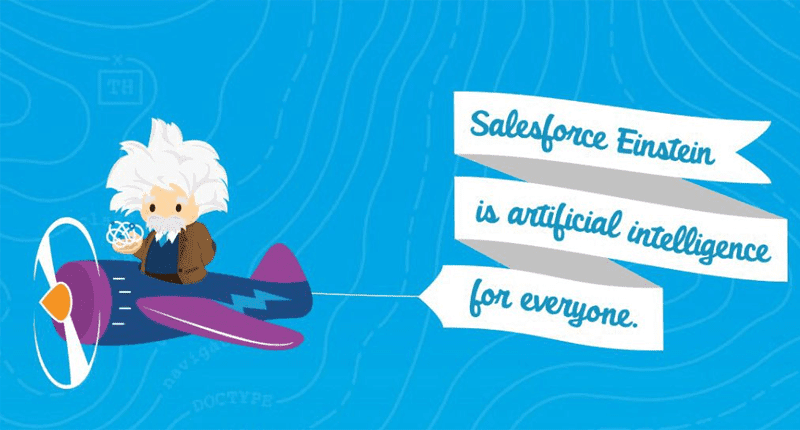 As a platform already familiar with integrations, the Einstein AI will utilize the already vast wealth of information gathered in Salesforce to help tailor the information most relevant to an agent, and offer new suggestions, solutions, sales opportunities or support. Of course, this sets Salesforce even further apart from the competitors, and offers something totally new to the industry. Einstein will be the result of already existing AI methods, such as natural language processing, machine learning, and even deep learning tailored to a specific sale, intelligent marketing and analytics approach. While the actual implementation has yet to be seen or explained in depth by Salesforce, the idea of Einstein acting as a personal assistant for agents utilizing Salesforce services isn’t one that’s very far from reality. 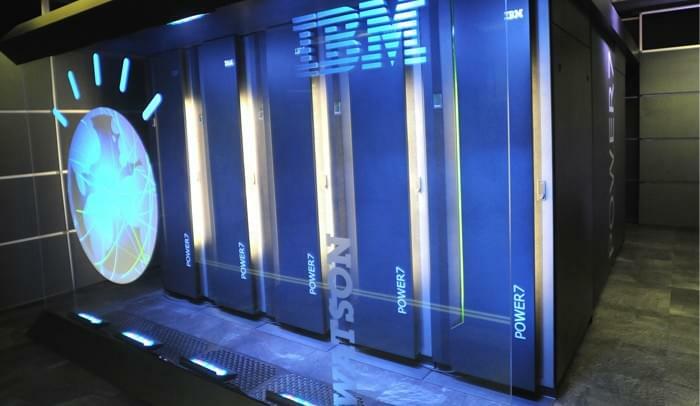 We’ve even seen something similar with IBM’s Watson and Cisco’s Spark. Einstein’s intelligence will be baked into the context of your business, and automatically discover new, relevant insights to help benefit every single interaction and bits of data already captured by the CRM platform. Einstein will be able to actively discover and share new insights, predictions, and recommendations for agents that are servicing a customer or client. For example, if a caller has a history of purchasing a product, and then calling in for technical support and damages, Einstein might notice this trend and offer the agent a number of suggestions, like an advanced support subscription, or a product replacement plan. Of course, the use cases here are almost endless, and the advanced AI will do the heavy lifting of analyzing the data, and offering the best suggestions about how to leverage that data. Perhaps, the strongest and most effective use for Einstein will be predicting the future. Salesforce explains in one of their blog posts surrounding the announcement, that leveraging the potential predictions of customer and client’s future actions is where the real benefit lies. Salesforce explains three levels of companies and how they leverage their current data. The highest level, or level 3 “companies know what leads will become opportunities, what opportunities will become customers, and what customers will become raving fans. If a prospect is falling out of the sales process, they can predict when and how to intervene to get them back on track.” Salesforce is all about helping companies reach this third level, where the CRM software “works for them as a predictive system of intelligence.” Sprinkle in advanced learning AI, and you can see where it all goes from here – now you have an advanced Artificial Intelligence to do even more of the predicting, even more accurately. 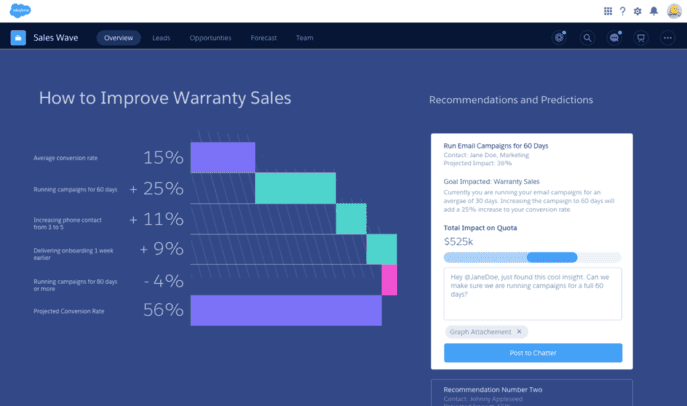 Broken into two categories, Sales and Service – Salesforce’s Cloud Einstein AI will allow users to capture data to analyze leads, prospect and customer interactions. 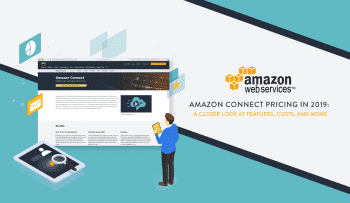 On the other hand, the Service Cloud Einstein AI will supply recommendations on the best method to respond and service customers, as well as predict the time it might take to resolve each case. Of course, Einstein isn’t the first use case of AI that we have seen leaking into the business world, as I had previously mentioned IBM’s Watson has been partnered with Cisco’s WebEx and Spark collaboration suites to boost productivity. 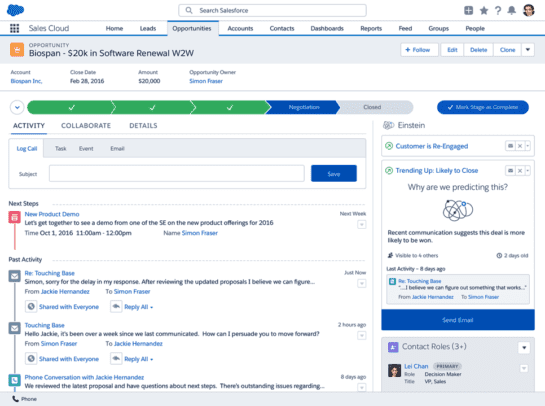 However, while Watson’s main goal here would be to empower collaboration, and act as a personal assistant for users, it’s not very far off the job Salesforce has planned for Einstein at all. Through combined advanced analytics, email, social and collaboration solutions, IBM and Cisco will be able to provide the right insights in the right context. Sounding a little familiar now? This is all about utilizing the immense, and rapid brain power of these machine “minds” to reduce downtime, boost productivity, and add in a new level of insight our human minds might have glossed over – or didn’t realize at all. Just like Watson, Einstein is equipped with advanced language processing to respond in normal, natural language, and better analyze the language we use. While for Watson this means conversations and information requests will feel more natural, but for Einstein this means a deep understanding of a sales call, or the agent’s notes, or a client’s call history – and allows Einstein to offer suggestions in natural language. I would even go as far as to tie this into one of my favorite insights, shared by Vonage CEO Alan Masarek during our discussion of the Vonage Master Plan. 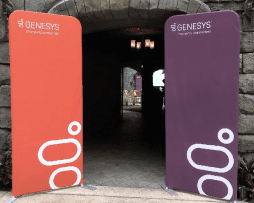 The latest trends are all about bridging the gaps between platforms, and an enhanced customer experience that leverages context, and does not lose context. 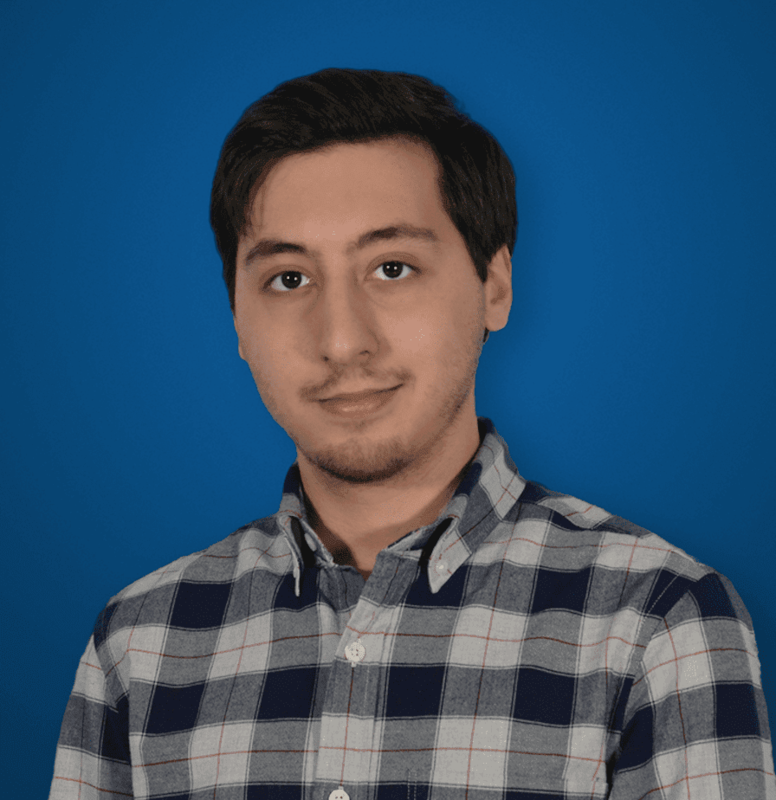 Alan presented the example of booking a flight online, calling into an agent, and having to re-inform the agent of every step you took online – all context around your issue is lost on the call, and you are treated as a brand new case, instead of a customer in the middle of a transaction. This is absolutely an opportunity for AI to come in and save the day – with Einstein enabled, the system could take a look at all the relevant information and context around a call, and offer suggestions or information to the agent to offer the best solution, the smallest amount of time.